A fairly simple mod, this involves fitting 999 100mm bore cylinders and specific pistons to a 749, giving 924cc, a 23.5% increase. The 749 and 999 shares the same cylinder stud spacing (along with the 1000DS, ST3 and 996) so the cylinders go straight in. The std 749 cylinders can’t be bored to 100mm though  they have a reduced OD at the bottom of the spigot and can only go to 95mm from memory, which gives 834, an 11.5% increase. The specific pistons are required as they need to be half the stroke difference longer in the compression height  the distance from the centre of the pin to the crown. 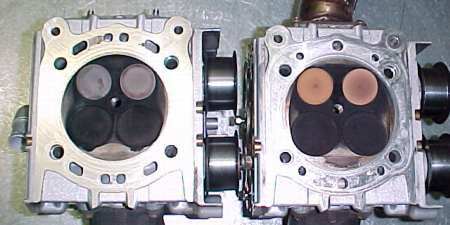 As the 749 is 58.8mm stroke and the 999 63.5mm the pistons are (63.5  58.8)/2 = 2.35mm taller. I’m told the 749R has the same pistons as the 999, being the only 4V model ever to have a unique rod all it’s own (2.35 or so mm longer) so you can just use std 999 pistons and cylinders to get 848 out of one of them. We used a kit from BCM Ducati, comprising some lovely Pistal pistons and some 999 cylinders. Bruce also modified a couple of 999 head gaskets for me, just to show me what he did instead of trying to explain it. Much easier, and I’ll know for next time. There is a bit of other work needed too  the 749 and 999 heads and cylinders have different water jacket castings. Sounds bizarre, but they are quite different. I don’t understand why. The photo below shows the differences. 749 base model head on the left, 999S head on the right. For those wondering why the 999S was in bits it had thrown a chain and done lots of nasty damage  cases, gears, alt cover, etc. And yes the exhaust valves are very light in colour. It was running a Termi full system (54 or 57mm, not sure) with ECU. Anyway, you need to modify std 999 head gaskets slightly to allow the passages to flow into each other and I bevelled/sharpened the divider between the two head passages a little to work better with the single port on the 999 cylinder. Apart from that it’s fit and away you go. We used 0.2mm base gaskets from the 998/999RS catalogues to get the squish down to a nice 1.0mm. Plus we opened the chambers around the outside of the valves to unshroud them and ran a cutter down through the seats to reduce the width and make them flow a little better. As for valves sizes the 749 has bigger valves than a 996, so there’s no drama there. The photo below shows the modified head ready to go. 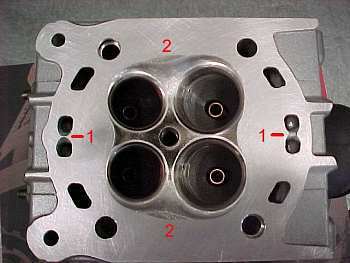 The number ‘1’ shows the bevelled coolant transfer ports, ‘2’ the modified chamber sides. Cam profiles for the 749 are the same as the 999, however the timing specs for the 749 has the inlet advanced 10 degrees compared to the 999  105.5 degree centreline as compared to the 999’s 116. This bike had previously had the cam timing reset to the 749 spec and this was not changed, which may affect the high RPM power a little. At the point the kit was fitted the bike was running a Termi asymmetric kit and we dyno’d it with a DP 999 asymmetric kit ECU. The plan was to tune it properly later using the U59 ECU. The graph shows the bike all std in green, with Termi asymmetric kit in red and with the 924 kit and DP 999 kit ECU in blue. For reference the pink curve is a ’03 999 with DP asymmetric kit. Power first, the torque. You can see how much the torque and power has picked up  up to the torque peak at 8,200 RPM it’s between 23 and 30% better, as it should be given the 23.5% increase in capacity. The shape of the curve is very similar too, with the tuning peaks at the same RPM as before. Peak power is up only 13% (without any real tuning), but power isn’t related to capacity as much as airflow, and we didn’t really make any airflow mods (porting, bigger valves, etc) to it. It may make some more power with tuning (which is to come) and I’m sure retarding the inlet cams would help too if we were chasing a dyno number, but that’s somewhat academic given it’s a road bike. I’m sure part of the reason the 999 is not further ahead in the midrange is the difference in inlet cam settings. How the 999 would work with 106 degree inlet centrelines would be interesting as it has 3mm bigger valves again than the 749. Adding a full system as compared to the Termi asymmetric kit would help the top end power too, as it does for any model in the 749/999 range. On the road the difference is skewed somewhat by the fact the 999 as std runs 15/36 gearing and the 749 runs 14/39, both with the close ratio gearbox. With this shorter gearing the 924 really moves. It may even benefit from longer gearing to tone it down a bit.